With just about five weeks left of classes, a sense of panic started setting in. 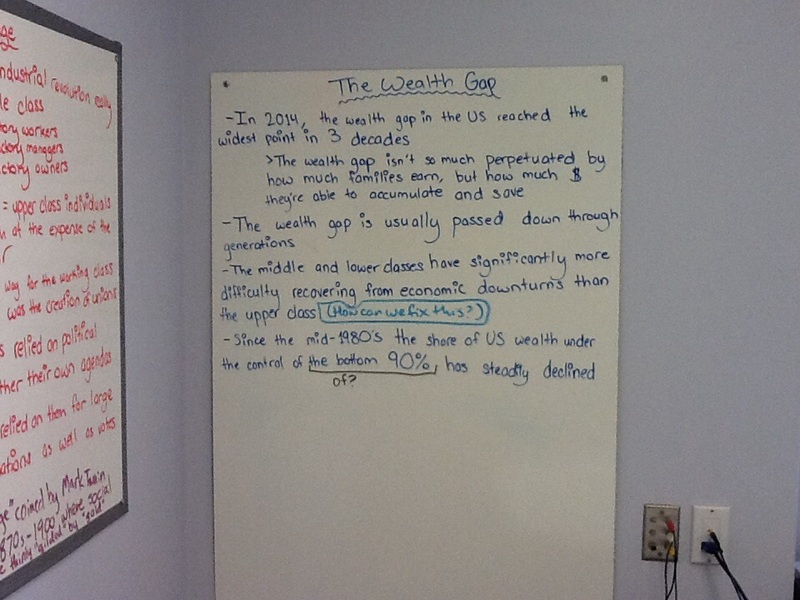 How would I be able to provide the students time to complete the Urbanization project they started, and still finish the chronological overview of the economic development of the US taking into account social class along the way. I am in the Gilded Age, where I hoped to stay for a few days, but then I realized that might mean condensing the Great Depression and the New Deal more than I would like. And forget talking about the Reagan Revolution. Yikes! While five weeks may seem like a long time, with our block schedule, the class meetings are limited. There is not enough time. I know it. So – what to do about it. One of the main reasons we switched to a thematic approach was to avoid the pressures of coverage that inevitably occur in a chronological approach. We make no promises about covering everything; in fact, it is clear to our students that we are selective in our approach. The point is not to have students hear or read as much as possible about US history. It is to help them understand important events and underlying issues in US society that have historical roots. We live in an extraordinarily complex era, and helping students to make sense of it matters deeply. When I was in school, it was not important to see events from multiple perspectives. There was one narrative. This has never been the reality, except in a classroom. I never really learned the local perspective on events; I certainly never considered that people in other parts of the country lived a very different experience, except in broad brush terms. There is so much I never thought about. I can’t cover everything, and that’s actually by design. 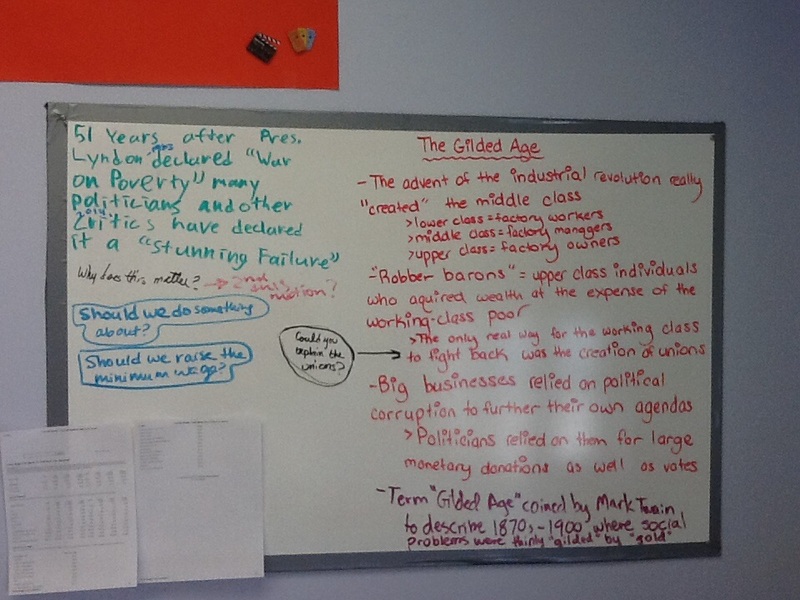 I should focus on the aspects of history that students know less about, rather than only walking the same old ground. Events and episodes that illustrate larger trends with a compelling story are worth making time for. Students can take more history courses and read more history books. My job is not to teach them everything but to equip them with the tools they need to analyze, evaluate, think about history. Equipping students with the knowledge they need to make sense of their world today needs to be a priority. There are limits to rational human activity – nothing is gained by pushing the students too far. We all need time to think and process. The end of the year may be more fruitful if I slow down, rather than give in to the urge to speed up. We are all tired. The reality is that I can’t know for sure how effective my teaching is. I take student feedback, read about teaching and learning, talk with my colleagues, and give it my best. Education is really a work in progress, which makes sense since all of us, students and teachers, are works in progress. After two months of the foreign policy unit, we wrapped up the unit with a class roundtable discussion about foreign policy. 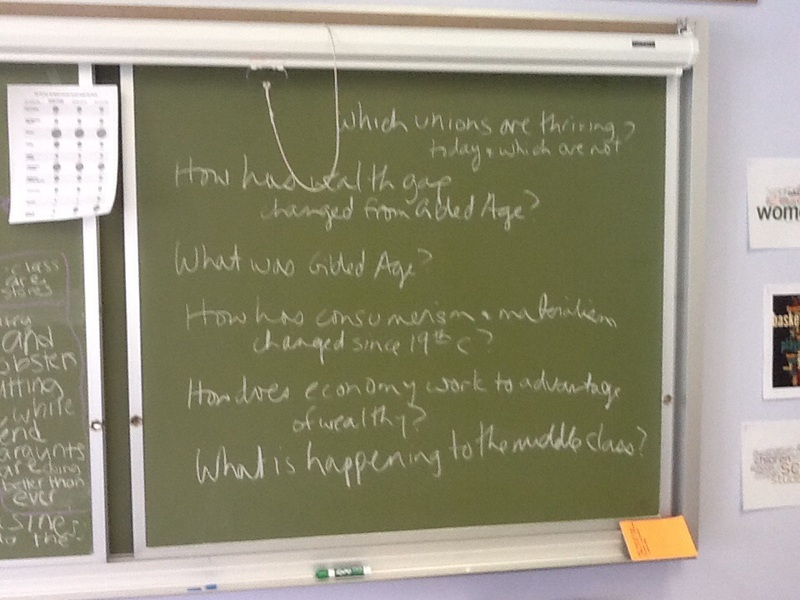 The idea was to revisit the essential questions we had identified at the beginning of the unit and try to address them with the knowledge and understanding students had gained in the course of the unit. The challenge was in coming to closure when during the last half of the unit, students had been working on individual or small group projects. One reason the unit took so long was the extent of the projects students presented at the end in order to teach one another. Many students used at least half of a seventy minute class period to do their presentations and answer the questions that followed. The roundtable discussions went very differently in my two classes. 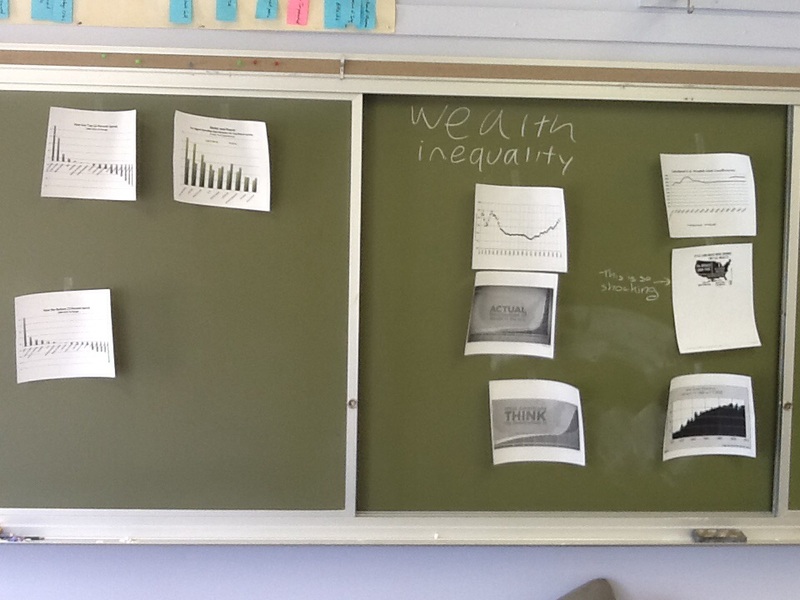 One class had really embraced the question and answer period at the end of each project developing many great conversations during the presentation phase. The other class tended to be more passive while viewing presentations, asking a few questions but rarely pushing the conversation forward. My expectations for the first class that had been so obviously engaged in the presentations were high. I imagined we would have this great wrap-up conversation pulling all of the threads together and really debating US foreign policy. For the other class, I was hopeful but unsure. I was concerned that after just a few minutes we would all be staring at one another. Both classes defied my expectations. The first class got hung up on discussing the CIA, to the point that it became unfruitful. While it was an interesting concept, there is only so far to go with the thread of the CIA acting as a terrorist or rogue organization. We quickly hit the limits of what we know with students branching into speculation. Some members of the class became frustrated at this narrow focus. I tried a few times to turn the conversation in a different direction, but I was also trying to let the students control the conversation. It was their roundtable. In the end, it was just too narrow a conversation to be satisfactory. One student came to talk to me about his concerns and we agreed to continue the conversation next class, with a broader focus and the express purpose of talking about things other than the CIA. That second class discussion was more directed by me, but it was more balanced. In the end, I guess it all worked – the students got to direct a conversation, and I got them to consider many of the aspects of foreign policy. Ideally that would have happened in one class, but at least it happened. 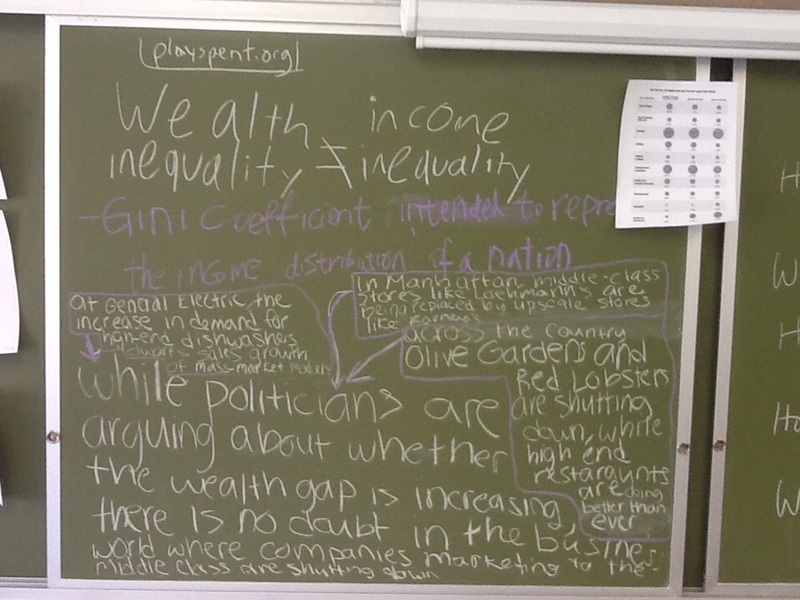 The other class took a more balanced, broad approach from the beginning, and despite the fact that it was the last period of the day, had a really good conversation. I acted as scribe, as I have come to do more often, and the students did the vast majority of the talking. They talked about the effectiveness of containment as a policy. Students also analyzed current events – Syria and Ukraine through their understanding of US actions in the past and current national interests. We ended up discussing what they believe the US role in the world should be. Interestingly enough, that is where we began the unit – with the documentary The World Without US. Now, those foreign policy considerations are resurfacing in the Economics and Social Class unit we have begun. 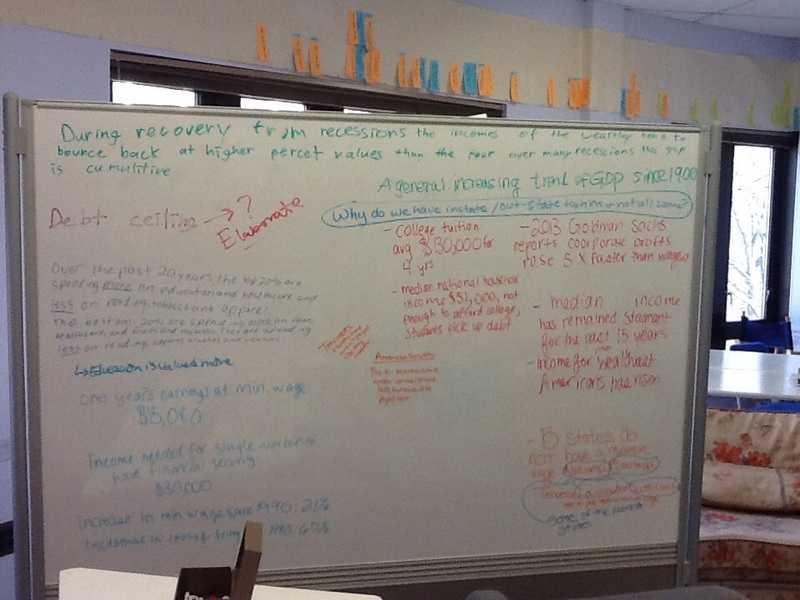 The students are also bringing back their work on immigration from an earlier unit. With the thematic approach, I am finding we can be a little more eclectic within the theme, but that each theme is adding another layer to the student understanding.